Well, that's the way it is. You're a fighter, you gotta fight. Hammers wait. The boxers step to the fore and we see none of the blows but all of the consequence. Moments, perhaps rounds, pass with a transitional crossfade as the sluggish weaken. Viewer as spectator. 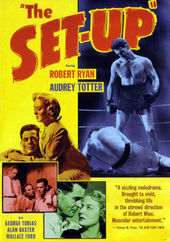 Based on Joseph Moncure March's narrative poem, directed by Robert Wise, and shot by Milton Krasner, A.S.C., the cold opening title sequence to The Set-Up focuses solely on the legs of the combatants with Wise's credit framed by a fall. The unintelligible holler of the crowd serves as the only score. Martin Scorsese on the commentary track, referring to Wise, "You know you are in the hands of a master."